Apeaksoft Phone Transfer is the best phone data transfer tool to copy content between iPhone and Android phone It supports all portable iOS devices, including X/8/8 Plus/7 /7 Plus iPad Pro, iPad mini 4, iPod touch, etc. Key Functions: 1.Transfer data Apeaksoft iPhone Transfer can transfer any content from iPhone/Android to iPhone/Android. Sync file between any devices freely. 2.Backup & Restore This program can Backup and restore your data when iPhone/Android device is dead or damaged, save your data easily. 3.Safe & Simple Phone Transfer is very easy and safe to use. Two cables and simple clicks are all you need. Even you are not good at the computer or your device, you can use it very easily. 4.Transfer all data between iPhone and Android for various scenarios a.Change old phone if you intend to change your old smart phone to a new one, but don't want to lose your precious data at all, Phone Transfer would be a big help. 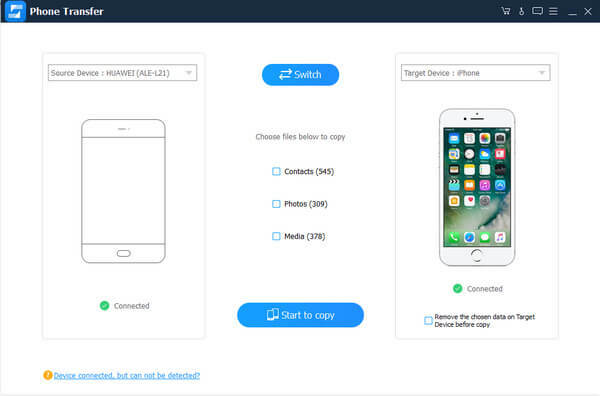 b.Switch files between iPhone and Android phone is a difficult task, Phone Transfer can help you do this with simple clicks. c.Your iPhone/Android phone is dead or damaged? Use this mobile data transfer software to rescue data at time. d.Want to remove all data on old mobile phone before selling it? Phone Transfer is a great tool to protect your privacy. 5.It support the latest devices. For Android, it supports Samsung, Sony, HTC, HUAWEI, etc. For iOS device, it supports iPhone X, iPhone8/8 Plus, iPhone7, iPhone SE, iPhone 6s Plus, iPhone 6s, iPhone 6 Plus, iPhone 6, iPhone 5s, iPhone 5c, iPhone 5, iPhone 4S, iPhone 4, iPhone 3GS. Check the full technical specification of Apeaksoft Phone Transfer and get the full understanding of the supported devices as well as file types.